Here, then, is the seventeenth instalment of the story of how Mary Jones and Thomas Charles triggered a mission to the world. Just over two years after Mary’s death, the Society published in its Monthly Reporter for 1 January 1867 an account of Mary Jones and her walk to Bala. Prior to this date, the Society had always attributed its foundation to the effect on Thomas Charles of an encounter with an unnamed Welsh girl who had walked several miles to read a Bible. Eleven years later, in March 1878, Society secretary S B Bergne wrote to Robert Oliver Rees at Dolgellau (on the north side of Mary’s mountain). In his letter to Rees, Bergne wrote: “It has occurred to us that the Library of this Society would be a most appropriate place for the Bible of the little Welsh girl whose history is identified in so interesting a manner with the origin of this Society”. Rees had the Society’s letter discussed at a meeting of the North Wales Association in Wrexham in June 1878. Since it was already becoming clear in Wales, as well as to the Society, that there was something very special about Mary Jones, the Association refused to hand over the Bible on the grounds that it was bound up with the history of Thomas Charles, Bala, and the Methodists. Later in the same year, the Religious Tract Society published an article about Mary Jones in its magazine The Sunday at Home. The article was based on research conducted by Rees, who turned his work into a booklet about Mary which was published in Welsh in 1879. After Bible Society made another attempt to get hold of Mary’s Bible, the Society’s request was considered by the North Wales Association meeting in Dolgellau in June 1880. The Association deliberated long and hard and eventually came to a decision. The Welsh would hand over the Bible to the Society on condition that another Bible “given to the same person [ie Mary Jones] at the same time” could be procured for Bala College. Two months later, the Society’s magazine Monthly Reporter announced that William Coles had travelled to Wales on behalf of the Society to verify statements about Mary Jones. In BFBS Gleanings next month, Coles reported that he had confirmed that Robert Oliver Rees’s account of Mary Jones was substantially correct and that he had gleaned some further interesting reminiscences of her. The Society made public its intention to erect the (present) memorial to Mary at her grave. In the spring of 1881, Lizzie Rowlands, who had visited Mary regularly in the last two years of her life, now lived at Penrhyndeudraeth where her husband was head teacher. One day, after a Sunday School meeting, she had a visitor. It was Dr. Lewis Edwards representing Bala College. They had a conversation. On her bookshelf was one of the three Bibles presented to Mary Jones by Thomas Charles – it had been passed on to Lizzie by Mary’s niece Lydia. “Gladly but sadly” Lizzie agreed to hand over the precious Bible to Edwards so that it might go to Bala College. 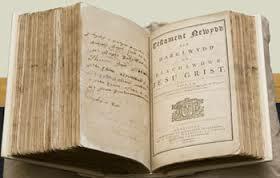 This Bible eventually found its way to the National Library of Wales in Aberystwyth where it is today. The arrangement satisfied Welsh interests and allowed Mary’s personal Bible to be handed to the Society.